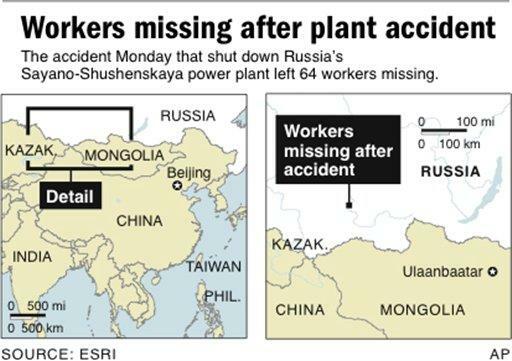 A massive explosion at the Sajano-Shushenskoj hydroelectric power station occurred on August 17, 2009, when a transformer exploded. These transformers had been in place for 20-40 years, performing reliably. Transformers "step-up" the voltage from turbines turned by the flow of water from the dam. Per the Zetas, location had something to do with this explosion, which was not caused by excessive water pressure or a defect in the transformers. Take the globe in your hands, the Universal Time Code (UTC) zone, i.e. Greenwich, facing you. Note that the location of the Sajano-Shushenskoj power station is at the side, to the right. Per the Zetas, the explosion was due to an electromagnetic tsunami caused by the clash of planetary magnetic fields between Earth and Planet X. This tsunami flowed from the clash point out over the edges of the Earth. ZetaTalk Explanation 8/21/2009: The cause of this accident will never be known as the evidence is in pieces. It will remain speculation, and because blaming a transformer that cannot be reassembled is the easy way out, this will be the claimed cause. If the transformers had a "fault" that finally proved fatal, it seems odd that it functioned for over 20 years, since the power station was fully operational. Transformers take the motion from a flow of water, convert this into a churning motion in an electromagnetic chamber to induce an electric current. If the flow is too strong, the churn can be too rapid, and presumably this is the logic behind blaming the explosion on a transformer fault. A rapidly turning turbine might overheat, would be the logic. But there are built-in brakes in power stations, so that such a runaway situation cannot occur. If there is too little water above the dam to meet the needs in many forthcoming months, the force of water is very carefully controlled so as not to waste water. What we are saying is that the force of water, the amount of water, can be controled at many points, and diverted if runoff is needed so the dam does not overtop. These controls are manual and automatic, with backup and overlap. Running a power station of this size is not a casual operation. Hey I wonder is this the so called sunwheel or is it Planet X and how can you see the difference between these two? This is not a sundog, a "sunwheel" as there is no halo around the Sun, and there is a reflection on the water from the object. Sundogs are reflected sunlight in ice crystals in the atmosphere that form along a halo line that circles the Sun, often appearing on both sides of the Sun at the same time, with a third sundog possible above the Sun. The point where the sundog touches the halo spreads out along the halo in a rainbow of colors. As the sundog is not an object in the sky but merely reflected light arriving at the eye of the beholder, it cannot generate a reflection on water. The photo, thus, is a genuine capture of Planet X at sunrise or sunset - the Second Sun. The second image is from Poland, taken on July 10, 2009, and appearing on the NASA website and in a science article in Buenos Aires. The photographer states she saw this Second Sun with her naked eye, so it cannot be discounted as an internal lens reflection. Explanation: How can the same Sun rise three times? 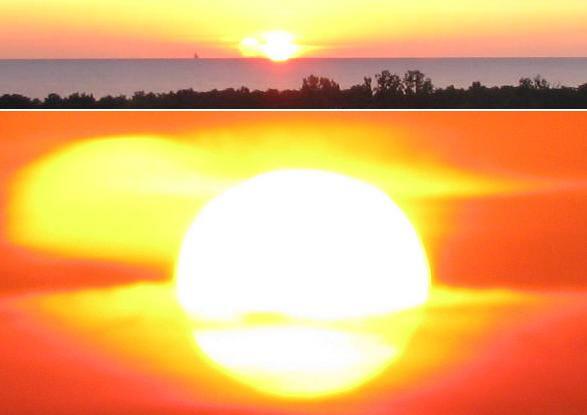 Last month on Friday, 2009 July 10, a spectacular triple sunrise was photographed at about 4:30 am over Gdansk Bay in Gdansk, Poland. Clearly, our Sun rises only once. Some optical effect is creating at least two mirages of the Sun -- but which effect? In the vast majority of similarly reported cases, mirages of the brightest object in the frame can be traced to reflections internal to the camera taking the images. Still, the above image is intriguing because a sincere photographer claims the effect was visible to the unaided eye, and because the photographer took several other frames that show variants of the same effect. El pasado 10 de julio un espectacular "triple atardecer" fue fotografiado en la Bahía Gdansk, en Polonia. El fotógrafo explicó que el efecto era visible a simple vista: una reflexión atmosférica óptica del sol, como si de tres soles se tratara. Aparentemente, el fenómeno llamó la atención de la NASA, que ya ha formulado una posible explicación: el fenómeno se trató de una extraña emisión de plasma solar. Por otra parte, LASCO 3 reportó hoy extrañas anomalías y se preveen nuevas tormentas solares de tipo C, para los próximos días. En concreto hay "alerta solar", para los días 7 y 8 de agosto, por lo que habrá que prestar atención a los patrones sísmicos y a la magnetosfera. The commentary from posters on the Argentine blog speculate that this is Nibiru or Herbulobus, both alternate names for Planet X. A debate on the NASA blog notes that it is not clear if the photographer took these photos while standing on a balcony, so window reflection might be a factor. Some posters note that Second Sun sightings can occur after sunset if sunlight reflects off the ocean and bounces off the atmosphere to the viewers eye, but these are always verticle reflections, not horizontal. In this case, there seems to be a vertical but primarily a horizontal reflection, above and to the left hand side. Note that where Second Sun sightings in the northern hemisphere are on the right of the Sun, in the southern hemisphere they are on the left of the Sun. This is because of the way the Ecliptic slants, in the view of those gazing at the sky. To put it crudely, those in the southern hemisphere are hanging upside down, where those in the northern hemisphere are standing upright. Or vice versa. Notice in this example below from Skymap that Venus seems to switch from the lefthand side of the Sun, for Boston, to the right hand side of the Sun for Buenos Aires. This is due to the Ecliptic slant. 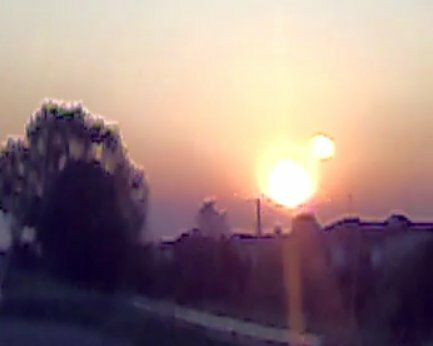 Thus, the photo from Poland, and the photographer's statement that she saw this Second Sun naked eye, seem to conflict with what is expected from Second Sun sightings in the northern hemisphere. The Polish photographer offered several additional photos for analysis. What is going on here? The Zetas explain. ZetaTalk Explanation 8/29/2009: The photos from Poland seem at first glance to be a Second Sun which is a window reflection of the Sun, though there are two reflections, above and below, which would not be the case in a window reflection. 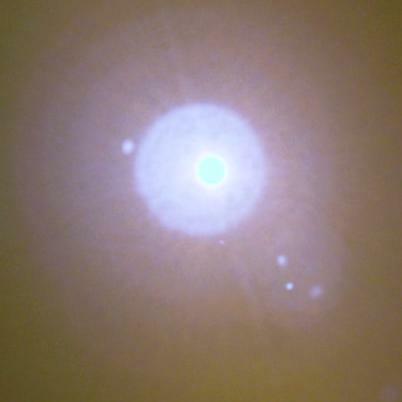 In an additional photo from Poland, these Second Suns seems to merge together into the upper left hand side. This is neither a window reflection nor a direct capture of Planet X at sundown, which we have been terming Second Sun sightings. NASA is featuring this photo in an attempt to confuse what they anticipate to be a rash of future Second Sun sightings, the genuine variety caused by Planet X. They are hoping to confuse both the term, "Second Sun" and the placement of the Second Sun in genuine sightings. What was actually captured in these photos from Poland? This is an atmospheric phenomena caused indirectly by the presence of Planet X, what we have in the past called the Monster Sun phenomena. When genuine Second Sun sightings occur light is bouncing off the immense dust cloud that shrouds Planet X, bouncing at an angle such that the light goes from the Sun to the cloud thence to Earth. A double reflection can occur during such times where the light going to Earth would not be directly into the viewers eyes, but hit water and ice in the atmosphere bouncing yet again at a tangental angle into a viewers eyes. This is what was occurring in the Poland snaps, and yes the photographer saw this naked eye as reported. A third example was captured in Padua, Italy on August 24, 2009, at dusk. The cameraman noticed an elongated Sun, and stopped along the highway to film it. There is no question about a reflection on a window pane, as cars passing on the highway can be seen and heard. Headlights are mandatory in Italy on such highways, even in daylight. Per the Zetas, this is a moon swirl capture, where sunlight funnels down a moon swirls and is focused and intensified. Moon swirls have been captured in the past, as often as the corpus of Planet X itself have been captured. Examples from 2003-2005 are from China, Italy, and New York. Hello everyone fom Fabrizio creator of the video in Padua! I've said previously for my other videos and I repeat once again: to me to be here mingling with Photoshop or anything like that plus I do not even know what they are and how to use them, losing hours to make fake videos to put on You Tube does not interest me at all! I was coming home from work, intrigued by the Sun which was slightly elongated on the right side and I stopped focusing with the camera on the elongation which turned out to be a second small circle! It is a video made in 2 minutes, downloaded to PC via Blue Tooth and on the internet, there are no fake trees made of cardboard or just pixeled Sun or anything else, maybe on a photo I could do it but not on a video for sure, plus I wanted to put music but I didn't even managed to do that! So, if what I filmed is Nibiru, Planet X, the Sun, Mercury, Venus or Mars I don't know. The fact is that the video is true, not modified or anything like that!! ZetaTalk Explanation 8/29/2009: This video is not a valid capture of Planet X, the Second Sun. It has no obvious flaws, though the quality is poor so details are hard to make out. The Ecliptic plunges from upper left to lower right in Italy at dusk, putting this theoretical Planet X above the Ecliptic and not to the right of the Sun along the Ecliptic as it currently rides. Even allowing for light rays bending to put a placement at a distance, this is too extreme. Then what is it? 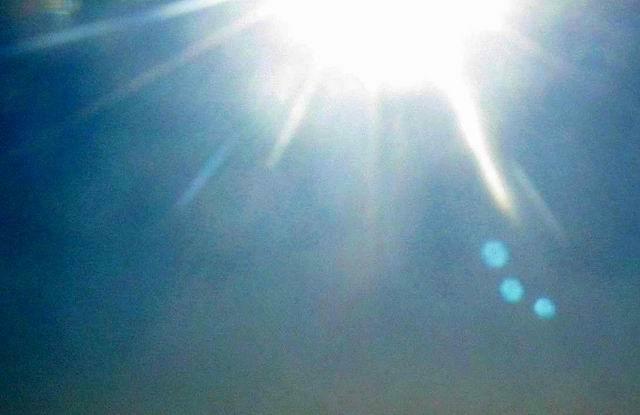 What could cause an elongated Sun viewed by naked eye, and dual orbs when captured on camera? When Planet X first arrived in the inner solar system in 2003, many of the photos were of the moon swirls, which form long tubes when seen from the side. These tubes focus light bouncing down the tube such that they appear as light orbs when the tube is turned toward the viewer. This focused light, coming down along a moon swirl tube, can be significant and mistaken for the shrouded Planet X corpus itself. Someone noted in an email to me documenting that the pace of collapsing bridges, worldwide, seems to have picked up lately. During the past two months, bridges have collapsed in India, Ireland, Winnipeg, Iowa, Mexico, and China. In India, a bridge that stood for the past 100 years collapsed without explanation. In Ireland, Winnipeg, and Mexico, the collapse is ascribed to excess or erratic tides undermining the foundations of bridge footings. And in Iowa, ascribed to a particularly heavy truck. But aren't tides and heavy trucks a normal occurrence? What is going on here? A crowd gathers at the site of a century-old bridge that collapsed near Kadirganj Bazar, in Navada district of Bihar state, India, Aug. 25, 2009. A truck, two cars and a cart carrying people plunged nearly 20 feet (6 meters) into the Sakari river, killing two people and injuring 20 others. The collapse of a railway viaduct on one of Ireland's busiest lines has been blamed on erosion of the sea bed. Initial tests indicate recent low tides and heavy rains combined to create a near-disaster on the Malahide estuary crossing on the main Dublin to Belfast track. The Highway 210 bridge over the Red River by St. Adolphe will remain closed indefinitely as one of its support piers continues to sink into the river bottom, making the bridge unsafe and possibly even susceptible to collapse. Slope instability likely caused by spring flooding appears to be the problem, although even that is not certain at this point. A complete collapse is not out of the question. There are hundreds of rural bridges in North Iowa whose integrity depends on how much weight is put on them. A Mitchell County bridge on Dancer Avenue near Mona collapsed, apparently after a heavy truck rolled over its span. Five vehicles were plunged into the water killing at least three people when a bridge collapsed on Friday in Mexico. Shocking images of a truck hanging precariously on the edge of a bridge in China show the terrifying moments following the structure's collapse. Three people were killed and 12 others injured after boulders destroyed the Chediguan bridge in Wenchuan County in the country's Sichuan province. This is the second tragedy to hit the region in the past year. 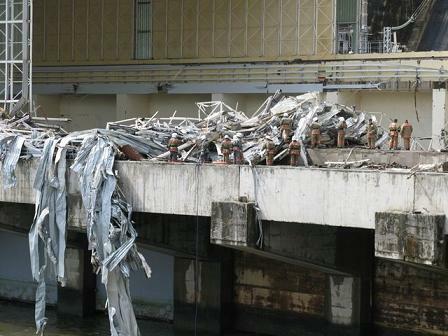 An earthquake on 12 May 2008 left almost 90,000 people dead or missing. The Zetas have long predicted collapsing bridges, along with other Earth changes such as train derailment, buckling roadways, and sinkholes. This will greatly increase in the last weeks, making travel difficult if not impossible. ZetaTalk Prediction 4/5/2003: Stretching results in quakes, as the plates underneath, in layers like flaky pie crust, release. Stretching results in land not supporting prior buildings or roads or bridges, which suddenly collapse. ZetaTalk Prediction 5/20/2006: But the worry that travel won't be possible won't really happen until we have increased stress on the crust and that would be the week of rotation stoppage in which the core is attempting to turn and the crust is resisting but they are attempting to stay together as one unit. The thick magma causing the core to be glued to the crust, or visa versa, and therefore the stress is greatly acerbated. It is during that week that you will have imploding cities, bursting gas mains and buckling roadways, so that travel will become impossible. The individual who noted an increase in collapsing bridges also points out that imploding buildings and derailing trains have also increased during the past two months, confirming the Zeta predictions that such Earth changes are related and will all be on the increase at the same time. Once again, Steve Shaman of Earth Frenzy Radio has had the ZetaTalk emissary on for an extended 2 hour interview. Listen to the archive stream or download for your iPod. Steve is the webmaster of the Skywatch website.